Where were the Illinois gubernatorial candidates when we really needed them? It’s good to see Democrats moving to the left as the gubernatorial primary ramps up—but what have they done for you lately? 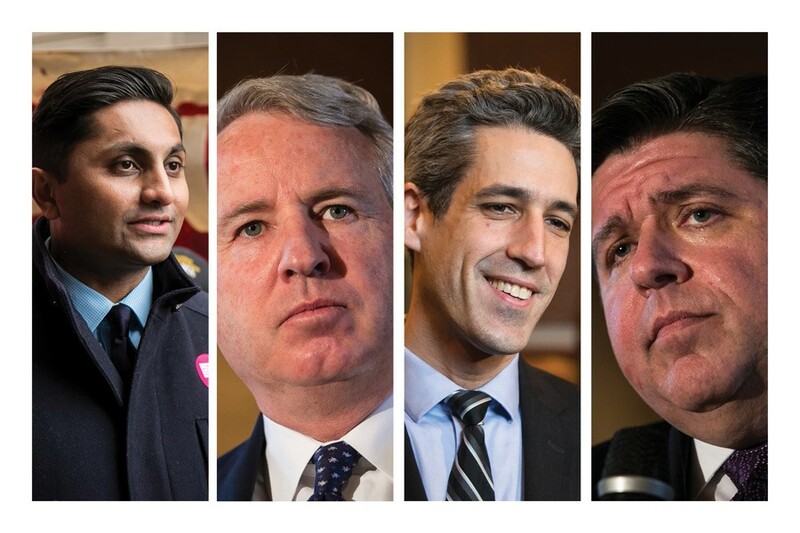 Gubernatorial candidates Ameya Pawar, Chris Kennedy, Daniel Biss, and J.B. Pritzker were missing in action for the last few years. Or, worse—they were on the other side of the good fight they now profess to be waging. As far as I'm concerned, the high point of this still embryonic gubernatorial campaign happened a few weeks ago, when alderman Ameya Pawar blasted Governor Bruce Rauner as a "racist." Pawar, who's running for the Democratic nomination, castigated Rauner for using racial "code words" to rile white downstate voters and play to their fears that any aid to Chicago's schools was a waste of money. OK, maybe Pawar's outburst was more therapeutic than pragmatic. It certainly didn't solve the state's budget crisis. But it did give me one of those at-least-someone's-telling-it-like-it-is jolts of satisfaction. Hey, that's better than nothing. It also made me wonder—where's Pawar been for the last five or six years? In the last few weeks, he's been sounding like the second coming of Eugene V. Debs, eloquently and passionately railing against income inequities, calling for progressive taxation, and demanding that Mayor Rahm Emanuel force the airlines at O'Hare and Midway to raise wages for their underpaid employees. By contrast, Pawar was pretty much an Emanuel loyalist during the mayor's first term, sticking with Rahm on many issues even as it infuriated community activists. I'm not picking on Pawar—I still may vote for him. And he's by no means alone. The gubernatorial race is filled with Democrats—state senator Dan Biss, businessman Chris Kennedy, and venture capitalist J.B. Pritzker—who've been missing in action for the last few years. Or worse, they were on the other side of the good fight they now profess to be waging. Consider Biss. Back in 2013 he was part of the effort to fortify the state's pension funds by stripping benefits from middle-class or working-class pensioners as opposed to raising taxes on the wealthy. Think of it as trickle-up economics. As for Pritzker, he was nowhere to be found in any of the critical political fights of this decade. In fact, it's not even clear how much of a Democrat he really is. In 2012, he gave an interview with a Bloomberg television reporter in which he said he hadn't made up his mind if he was going to vote for Barack Obama's reelection. Kennedy not only stayed out of all the local battles, he donated $5,000 to Emanuel's reelection campaign. Biss is leading the charge for a bill that would end the carried-interest tax loophole, which enables wealthy hedge fund and private equity operators to dodge paying millions in Illinois taxes. A headline in Crain's Chicago Business blasted him as a "traitor" for proposing the bill—a castigation that Biss calls "a badge of honor." Meanwhile, Kennedy is leading the charge to reform our antiquated and unfair property tax system. Man, we could have used some of his roll-up-your-shirt-sleeves outrage when Mayor Rahm was closing all those schools! Of course, I get what's going on: In a primary, Democratic candidates move to the left to woo voters like me. You know, the real Democrats in the party. But are we supposed to forget how these candidates behaved in the times when they were taking our votes for granted? For the last six years, they apparently bought into the conventional wisdom that Democrats should rule as if they were Republicans. For the most egregious example, let's go back to January 2012. Back then we had a Democratic mayor in Chicago (Rahm), a Democratic governor (Pat Quinn), and two Democratic-controlled houses in the Illinois General Assembly. And what did they do with that power? Emanuel, Quinn, state senate president John Cullerton, and house speaker Michael Madigan signed on to a tax break for the Chicago Mercantile Exchange at roughly the same time that the City Council (also filled with Democrats) unanimously passed Rahm's budget that closed six mental health clinics in the city's poorest neighborhoods. There was apparently enough money to give a tax break to some of our wealthiest citizens, but not enough in the coffers to provide desperately needed therapy for people dodging bullets in high-crime areas. I don't know if keeping those clinics open—or, better yet, opening new ones—would've curbed the violence of the last few years. But it would've been a step in the right direction. Instead, those in power shamefully went the other way. Oh, there were activists who protested—they even staged a sit-in at the mayor's City Hall office. But no elected official, mainstream leader, or influential figure in the state or the city raised a voice in support—Biss, Kennedy, Pawar, and Pritzker included. As a result of betrayals of this sort, the Democrats have lost a lot of credibility. They demonstrated they couldn't be depended on to make a principled stand for the little guy when it mattered the most. Now look where it got them. Voters in rural areas of Wisconsin and Michigan went for Donald Trump, even if it meant going against their economic self-interests. And many potential voters in black communities on the south and west sides of Chicago didn't vote at all. So between the voters who voted for the other guy or the Democrats who didn't vote at all—well, that may help explain why Rauner's in the governor's mansion and Donald Trump's in the White House and Republicans control both houses of Congress. Last night's Democratic debate was another reminder that Illinois Dems spent the better part of the last ten years acting like Republicans. Does a socialist alderman from Chicago make Daniel Biss’s gubernatorial ticket any more appealing to Illinois voters? The state senator has chosen progressive 35th Ward alderman Carlos Ramirez-Rosa as his running mate. Why aren’t women running for Illinois governor? The governor’s race remains a sausage party. And as a result everyone who looks to the Democrats for leadership suffers. The 47th Ward alderman and gubernatorial hopeful conjures FDR in a run against Rauner. Advocates fight for patients a year after Rahm shuttered mental health clinics across the city.